Both presenters gave a lively and engaging account of their extensive research processes and each offered conclusions that highlighted the benefit and difficulties of direct material analysis research. 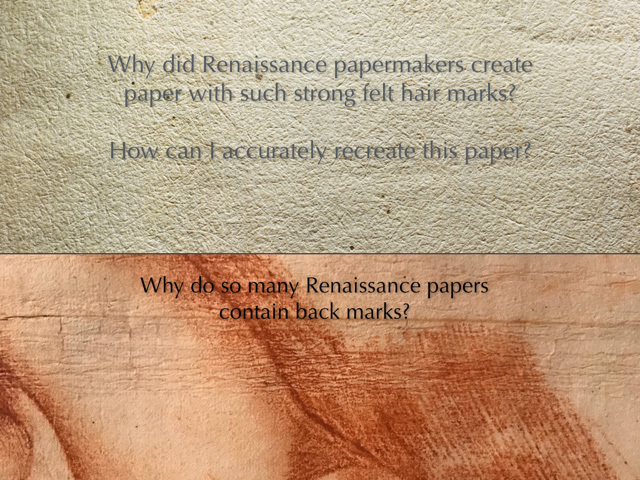 Mr. Farnsworth’s presentation “Renaissance Paper Texture” covered his effort to recreate the specific physical characteristics of pre-seventeenth century Renaissance paper—in particular, the heterogeneous surface texture of coarse felt marks. Felt marks are marks made by the pressing of freshly couched sheets of paper between animal hair felts. In the Renaissance, felt hair was coarse and imparted a unique character to paper, which artists used in creative ways when drawing. Felt marks largely disappeared from paper by the mid-eighteenth century. Farnsworth also discussed artifacts often seen in Renaissance paper such as back marks, which were a consequence of draping pressed but still damp sheets of paper across suspended horsehair ropes to dry. Back marks often appear as long wrinkles in the middle of the sheet running parallel with the chain-line direction, which, as Mr. Farnsworth noted, would likely have aided in achieving a desirable drape in the text block once the pages were bound together. Back marks are also a useful indicator of a sheet’s sidedness. The ultimate goal of Mr. Farnsworth’s research was to discover the materials and processes that could allow him to recreate the paper textures of the Renaissance for use by contemporary artists. Toward that pursuit he traveled extensively, searching out primary sources in which he could observe such marks, animals that could provide the proper coarseness of hair and felt makers who could produce felts from such sources. In particular, Mr. Farnsworth found that the Navajo-Churro breed is genetically similar to the breeds whose wool would have been used in felts five hundred years ago. In 2017, after years of research, study, and experiments, Mr. Farnsworth’s paper studio was able to reproduce felt marks with the same coarseness and variegated surface evident in works on paper by the greatest of Renaissance artists. For more information and downloadable pdf documents concerning this and other topics of Mr. Farnsworth’s research, visit magnoliapaper.com. Cathleen A. Baker’s presentation, “Typographical Variants on Wove and Laid Papers in Baskerville’s Virgil” addressed two topics: 1) the typographical variants found throughout Mr. Baskerville’s first edition of the works of Virgil and 2) the development and use of wove paper in the first edition which, unlike the second edition, contains both wove and laid paper. John Baskerville’s papermaker was James Whatman Sr. and unraveling the mystery of his initial experiments making wove paper, assumed to be the first use of it in the West, led Dr. Baker to conduct experiments in an attempt to recreate it. Direct material analysis was essential to these experiments since it was her working theory that the wove pattern in the paper used for Virgil did not come from a woven-wire screen but instead came from a laid-wire screen with a woven fabric placed on top. To prepare for the tests she first received a loan of five single-faced laid moulds from mould maker Tim Moore and added to each a different fabric with weaves ranging from open to dense. Next Dr. Baker worked with Tim Barrett at the University of Iowa’s Center for the Book to make paper with the adapted molds. Through these experiments she was able to successfully reproduce the woven-fabric patterns as well as the rib shadows and chain lines that can be found in the Baskerville’s Virgil. In her discussion of typographical variants Dr. Baker demonstrated most clearly the research treasures that can be mined from a concentrated analysis of a single subject. For example, Philip Gaskell in his 1959 book John Baskerville: A Bibliography establishes that the first edition is identifiable by a single variant on the title page. However, in her research Dr. Baker was able to identify a third version of the title page variant in a copy housed at the Bodleian Library. The library had catalogued it as the second edition, but Dr. Baker was able to identify it, presumably through other variants, as the first edition. Her research also shows that there are many more typographical errors within the wove paper sections than the laid paper sections. The reason for this typographical discrepancy between the wove and laid sections was not made clear in the talk, but for those interested in learning what conclusions might be drawn from her research Dr. Baker is currently writing an article for publication next spring that will cover her Virgil papermaking experiments. She is also working on a book that will cover this subject and the larger history of wove paper in the 18th century. The importance of direct material analysis was the theme that bound these presentations together. In her research Dr. Baker was able to study 127 copies of the first edition. Forty of those were studied over a month long trip to England which was made possible by a 2018 fellowship from the Bibliographical Society of America. No doubt her wide survey of this book and the opportunity to observe the subtle variations of wove paper contained in them were a great aid in finding the suitable fabric for replication. Likewise, Mr. Farnsworth’s willingness and ability to go wherever his material needs led him has resulted in a new knowledge of papermaking that not only expands our historical perspective on the craft, but also has the potential to deepen our understanding of Renaissance artists that worked with this paper. The difficulty for anyone interested in this level of material research is primarily financial support, but for the intrepid and resourceful artist, craftsperson, or academic it is only encouraging to see what discoveries are possible when we can dive deep within them. Adam Bryant is a first-year MFA student at the University of Iowa Center for the Book.